Ok I’ve finally cracked it (pardon the pun) a healthy, simple, tasty scotch egg recipe. I’ve had a few attempts at making paleo friendly scotch eggs. Including ones coated in almond flour (I didn’t like) and ones with no crumbed outside (I didn’t like) I’m not hard to please but if I’m going to enjoy a healthier scotch egg I’d like it as close to the real thing as possible and I reckon I’ve done it, by using a secret ingredient that I had in the cupboard all along! These really do taste amazing and full of flavour! 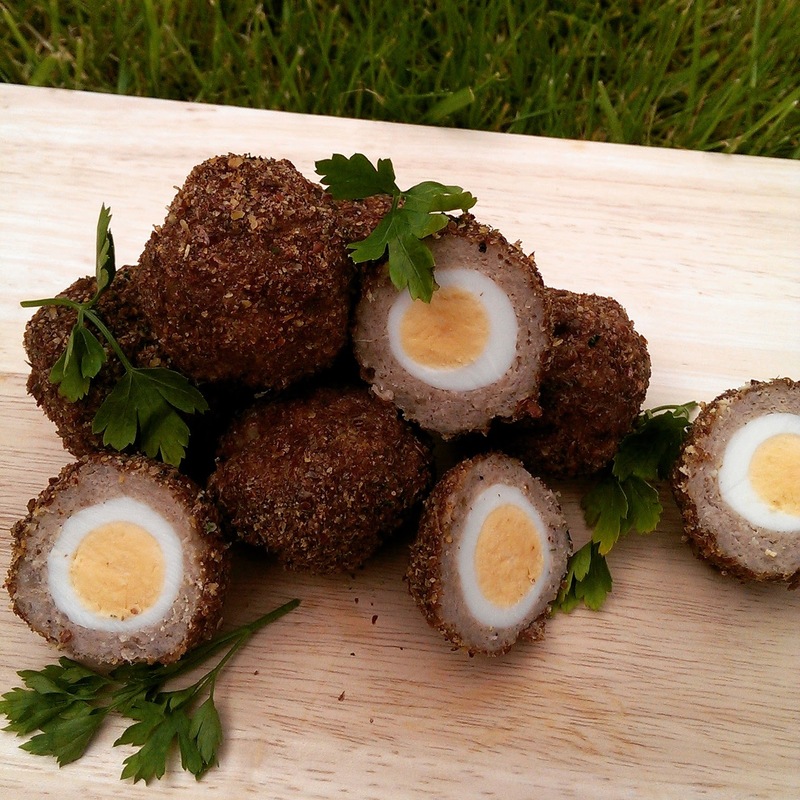 Quail scotch eggs are perfectly bite sized and will be my must for picnics this Summer. I used Quail eggs from www.posh-birds.com they are super delicious and you can find them in Tescos. Flaxseed is a natural source of Omega 3, Magnesium, Calcium, Iron and Fibre. Flaxseeds also contain no added sugar and are gluten free. I added the quail eggs to a pan of boiling water. Left to boil for 2mins. Drain hot water away and covered with cold water. (this stops them from cooking any further) after 10mins peel and dry on kitchen paper. For the meat coating I used Cumberland sausages that had a high meat content from Aldi. I removed the skin and cut them in half. My portion guide is half a sausage per quail egg. 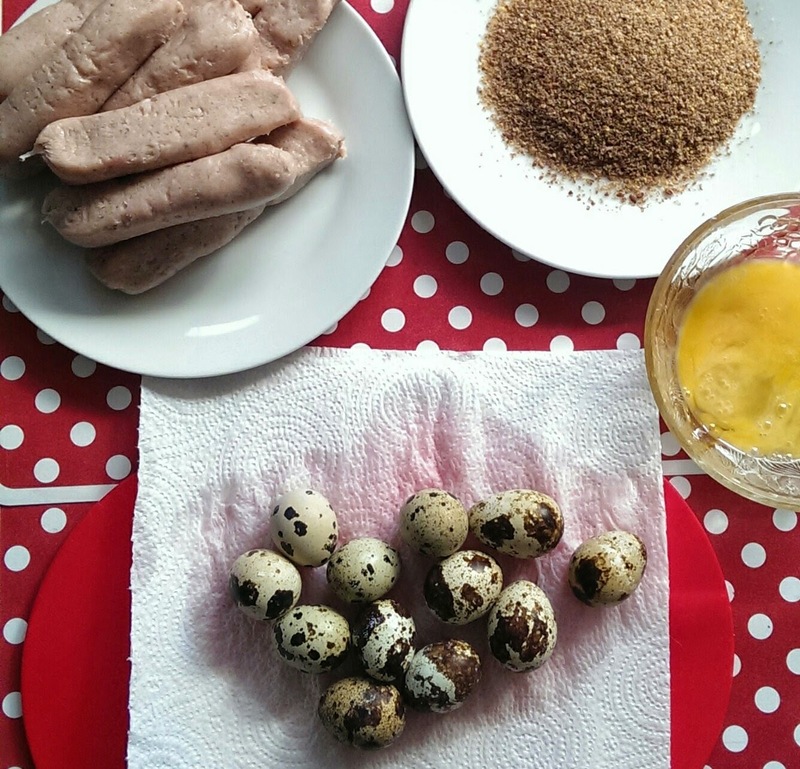 Take half a sausage and press it on your Palm into a circle, place a peeled quail egg in the center and mould sausage meat around the egg, roll between both your palms to get the ball shape. Do this to all 12 eggs. Next beat an egg in a bowl. Put the flaxseed and parsley mixed together on a plate. Take a sausage wrapped quail egg in your left hand and roll in the egg. Transfer to the flaxseed plate. Using your right hand roll around your meaty eggy ball until covered evenly in the flaxseed mix. Pop on a rack on a baking tray. Do this for all 12. Bake in the oven for 20mins until golden brown. Please always feel free to share my recipes, and leave any feedback in my comments.